When it comes to balancing your diet in order to provide the best support for achieving your fitness goals, you may not be sure which approach will yield the best results. One common rule of thumb used in the health and fitness industry states that roughly 75 percent of weight loss comes from optimal nutrition while 25 percent results from consistent exercise. Even if you are becoming a real gym rat, those gains will be hampered if you reward yourself with a trip through the fast food drive-thru. 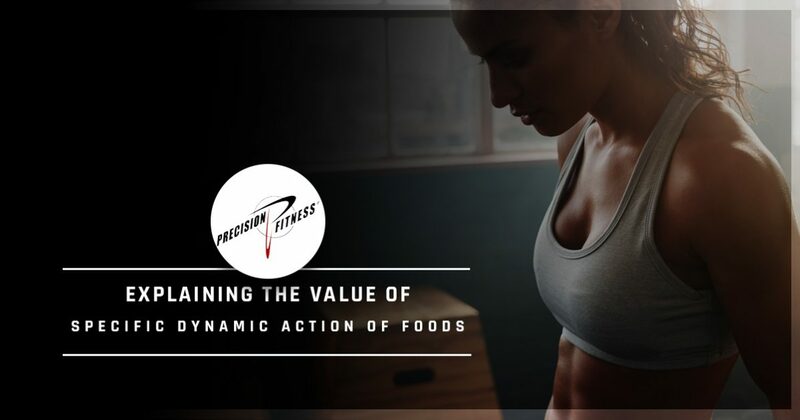 Precision Fitness is here to offer the best fitness coaching, nutritional support, and sports performance training in Cornelius, delivering personalized services to help you crush your goals and regain control of your health. Since 2001, our North Carolina fitness gym has focused on providing a comprehensive approach to healthy living for individuals of all types. People may say that we’re fanatical about sports nutrition, but we like to think of ourselves as driven. Our team is constantly striving to educate our clients on the value and complexity of nutritional support for their fitness plans. Today, we’ll briefly discuss the thermic effect of food (TEF) and how it can play a major role in your nutrition program. Also known as specific dynamic action, or SDA, this is the method used for calculating how much energy is expelled in the process of breaking down foods for use or storage. It’s important to know that your body will need to break your food down into its most basic units in order to enter the bloodstream. The process of breaking down this food will require energy, or calories, and is a major part of your overall metabolism. The thermic effect of food also produces heat within your brown adipose tissue, which adds to the total amount of energy needed for thermogenesis. How much energy is needed to break down your food depends largely on how dense and complex that food is. Also known as dietary induced thermogenesis (DIT), this process follows a relatively simple equation for determining how many calories are used instead of stored. For every 100 calories of butter consumed, your body will burn about 12 calories for absorption. With 88 calories remaining for use, the SDA of your butter will be 12 percent. Foods that have a complex structure with higher levels of protein, such as cottage cheese, will require much more energy to assimilate. If you consume 100 calories of cottage cheese, about 70 calories will be left at the end to utilize. Thus, the SDA for this food is 30 percent. The type of food consumed will play a large role in the SDA, with carbohydrates requiring between 5 and 15 percent while proteins can reach upwards of 30 percent. The foods you consume in combination with regular exercise can help to maximize your SDA, burning more calories in digestion and storing less in the process. If you are looking to take charge over your health and fight back against processed foods and a sedentary lifestyle, Precision Fitness can help. Our experts offer a full-scale approach to health and fitness, delivering quality nutritional support, fitness coaching, and sports performance training to Cornelius citizens. Contact us today to see how our fitness center can help you thrive!